I've got a quick post today. I made a card for the Outlawz Progressive Freebie Challenge. It's been well over a year since I've been able to participate in their awesome challenge, so it feels good to be back at it. 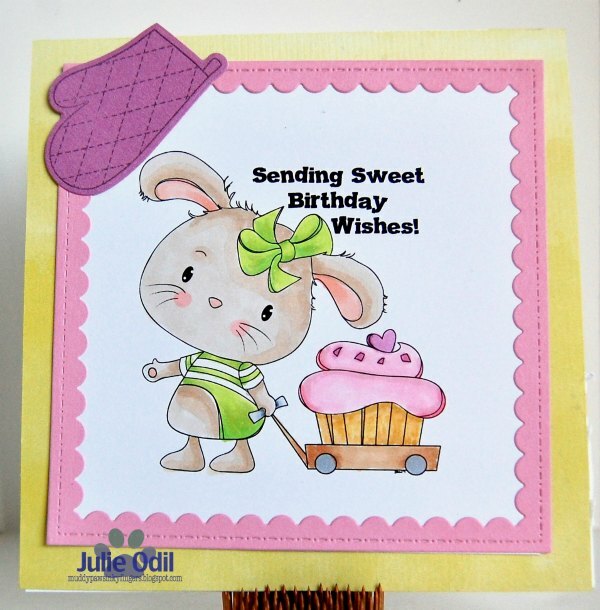 The image this month is from Di's Digis, called Bunny Cupcake Wagon. Part of the reason I decided to jump back in the challenge was the adorableness of this image! I colored Bunny Cupcake Wagon with Copic markers. The frame is a cutting die from Craftin' Desert Divas. The oven mitt is a stamp and die from Close To My Heart. The sentiment was computer generated. F-r-i-d-a-y!!!! The last Friday of January already! 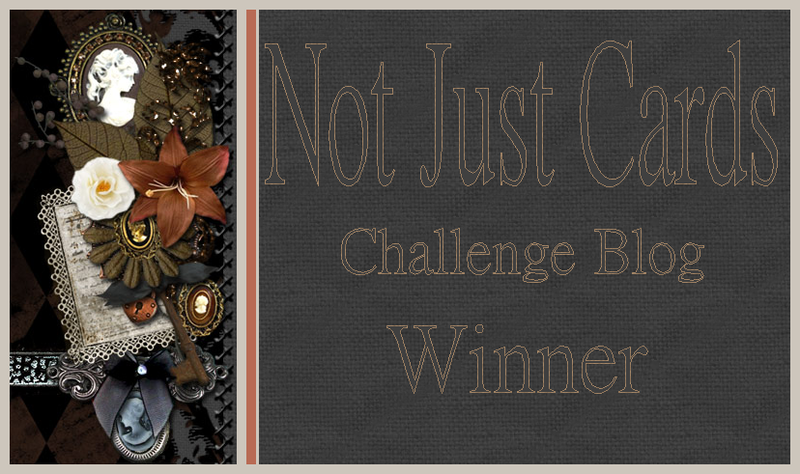 Friday means it's time for a new challenge at QKR Stampede Challenge Blog, where our challenges are now Anything Goes! 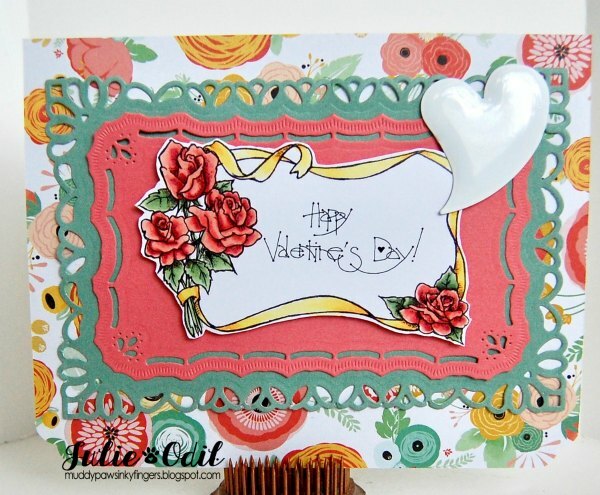 This uses Rose Label, colored with Copic markers, then fussy cut and Happy Valentine's Day sentiment (ES-digi1106). 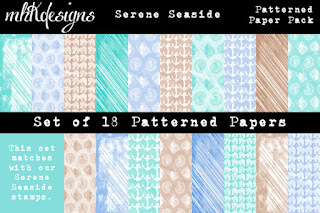 The designer paper is digital, and was purchased from Snap Click Supply. The fancy die cuts were cut out with dies from Spellbinders Paper Arts. The large heart die is from Paper Wishes. I hope you can join us this week at QKR Stampede for our Anything Goes challenge. We have great digis for you to win, and I'd love to see what you make! Greetings, crafty friends! 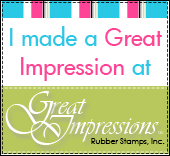 I'm super excited to be sharing my first post on the Addicted To Stamps Blog. This is image #952, found in the Sherri Baldy Etsy Shop. Isn't she sweet in her winter boots? I used some of my favorite Copic colors on her, and cut out the card base on my Silhouette Cameo. The sentiment was computer generated. I used dies from Paper Wishes for the sentiment and the gold snowflakes. 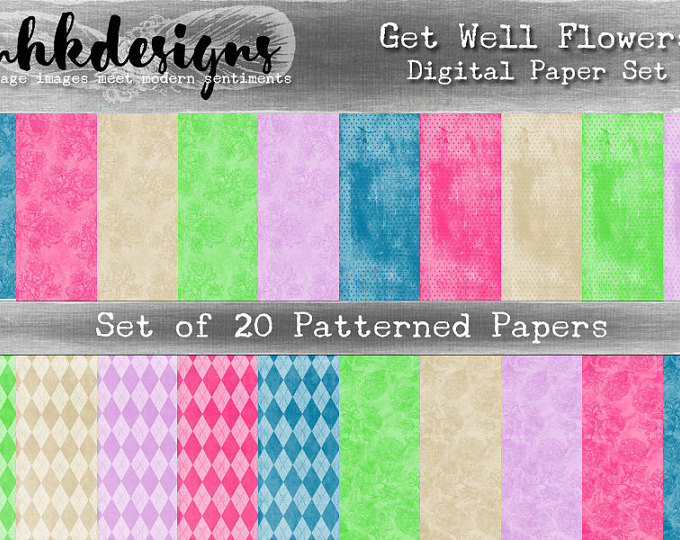 The designer winter paper is digital, and can be found at Snap Click Supply. Blue, blue, this card is blue. Blue is this card because I'm missing you! And, because Shades of Blue is the optional challenge theme at Path of Positivity this month. To be eligible for the prize from our guest sponsor, your card must be 55% blue. I think this one is! I used papers from one of this month's sponsors at Path of Positivity Challenge Blog this month, Decosse's Dynamite Doodles. The 2 blue papers on this card front are from Lisa's Naturally Cool Digital Set. The heart was cut out with a stitched die from Lawn Fawn. 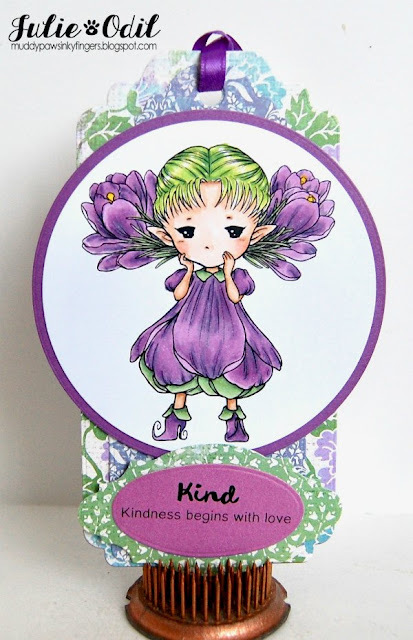 The sentiment is a stamp set from Simon Says Stamp. The butterfly sticker cluster is from Pebbles Paper Co. The twine is from my stash. Which do you like better? Lots of blue or the pink heart version? Blue is one of my favorite colors. I wear a lot of blue (it brings out the blue of my eyes), but I also find myself using a lot of blue in my crafting. How about you? Is blue a color you gravitate towards? I hope you find time to join us over at The Path of Positivity Challenge Blog where the optional theme is Shades of Blue. Or, if you like, you can link up any positive-themed project. Hello, crafty friends! I'm on the MHKDesigns blog today featuring this month's new release, Framed Favorites, found in the Etsy Shop. I used Faber-Castell pencils on Kraft on one of the framed flower images that come with the Framed Favorites digital stamp set. I kept the rest of the card simple so the image would be the focal point. There is a bit of MHKDesigns Seaside Digital Paper Pack on the card. Don't forget to join in on the MHKDesigns monthly challenge. You have until January 31. Yea! Friday! Plus, the weekend is looking a bit warmer than it's been here in NW Wisconsin. Last weekend, we didn't break 0 degrees Fahrenheit, so getting outdoors was difficult. This weekend, we might even get above freezing! It's Friday! And that means it's time for a new challenge at QKR Stampede, where they are always Anything Goes. 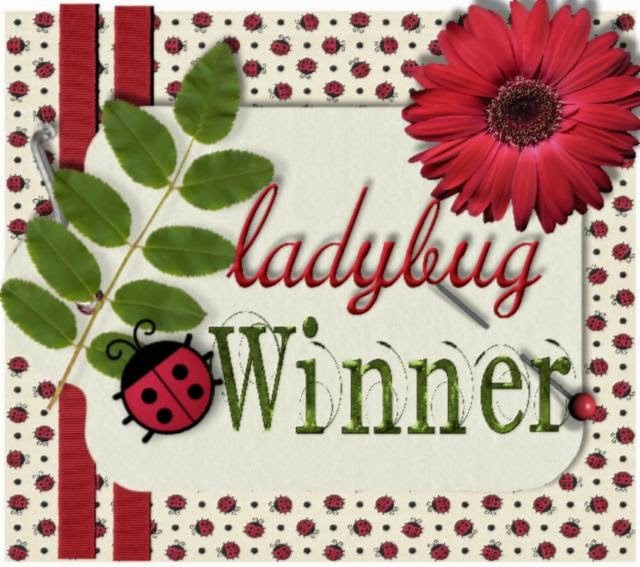 If you use a QKR Stampede, or Eureka Stamps image, and win, you'll get more free digis! I colored Hitch Hiking Snowman with Copic markers, using all my cccc-o-l-d colors! The sentiment was computer generated, but is very heartfelt!!! I found the card design in the Silhouette Online Store and cut it out on my Silhouette Cameo 3. The gold snowflake was cut out with a die from Paper Wishes. This Hitch Hiking Snowman was very fun and easy to color. I have a good friend who I send cards to each week. I've been doing it for years, and he's now 96. This one is in the mail and heading his way. He'll get a hearty laugh out of it, I know. 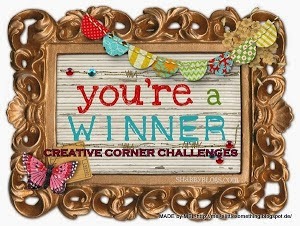 I hope you can join us this week at QKR Stampede Challenge Blog for our Anything Goes challenge. I'd love to see what you make, and we've got great prizes for you to win -- like this digi!! 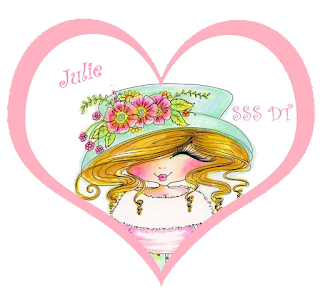 This card uses DigiStamps4Joy digital stamp Diamond Beauties (JA2). I colored Diamond Beauties with Copic markers, then fussy cut the image. When I was thinking of 'favorite color combination', I thought Copics. The very first Copics I ever purchased were R81, R83, and R85. They are still my go-to pink color combination, and I used them on the flowers on the Diamond Beauties, with the addition of R89. I love pink and blue together, so I looked for a paper that would have both, and would look good with the image. 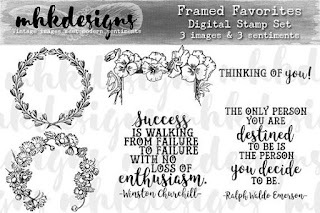 I found it on a DVD full of printables from Tattered Lace. 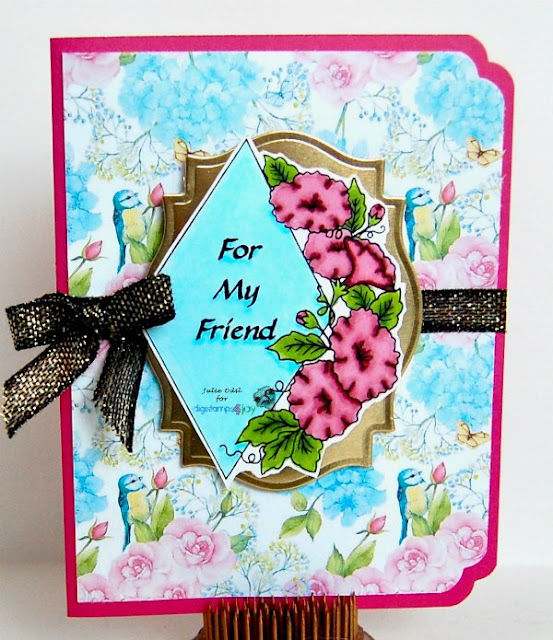 The gold label behind Diamond Beauties is a Spellbinders die and uses a gold paper from Spellbinders Paper Arts. The black ribbon and raspberry card stock card base are from Close To My Heart. I hope you can join us at DigiStamps4Joy for our optional "Favorite Color Combinations" challenge, or link up anything you'd like. I'd absolutely love to see what you make, and we've got fantastic digis that you can win for prizes! There's still plenty of time to join in the fun! It's Friday! That always has such a happy sound to it, doesn't it? That means it's time for a new challenge at QKR Stampede Challenge Blog. All our challenges are Anything Goes now. Oh, that is SO much fun! It uses Fine Art Rose (ES-digi6102), colored with Copic markers, and Happy Anniversary (Q-digi12007) for the sentiment. The Fine Art Rose was a breeze to color, if you like to color flowers. It was already so shaded, the task was mostly done for me. 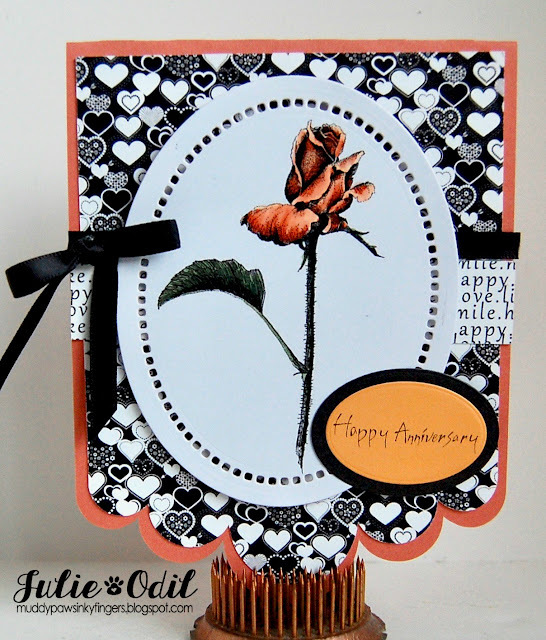 I used a hemstitch cutting die by Spellbinders to cut out the rose and the sentiment. 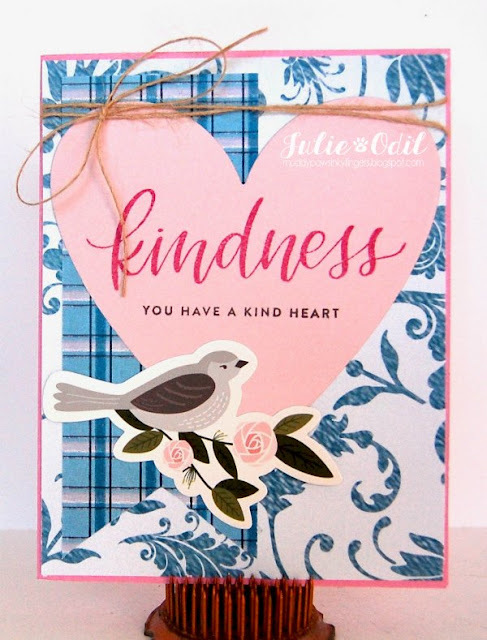 The card base is an SVG file by Pretty Paper, Pretty Ribbons. The designer papers are by Imagine That! Digistamp. The black ribbon is from Really Reasonable Ribbon. I hope you can join us this week at QKR Stampede. Remember, it's Anything Goes! 2018! 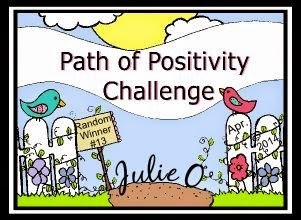 We're starting new a challenge at the Path of Positivity Challenge blog today, and we're starting a new set of themes. Each month, we'll focus on a different color scheme. As always, you're project must be positive and uplifting in nature. Keep that in mind before you link up, please. This month's theme is "Shades of Blue". 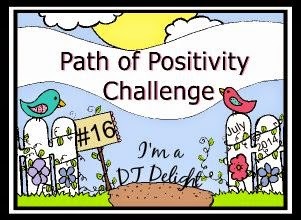 We have 2 sponsors this month at The Path of Positivity. We're sponsored by Scribbles Designs, and by Decosse's Dynamite Doodles. I colored Hedgie with Flowers with Copic markers. I used a variety of circle dies from Lifestyle crafts to cut out the colored image and the papers from the Naturally Cool digital paper pack. 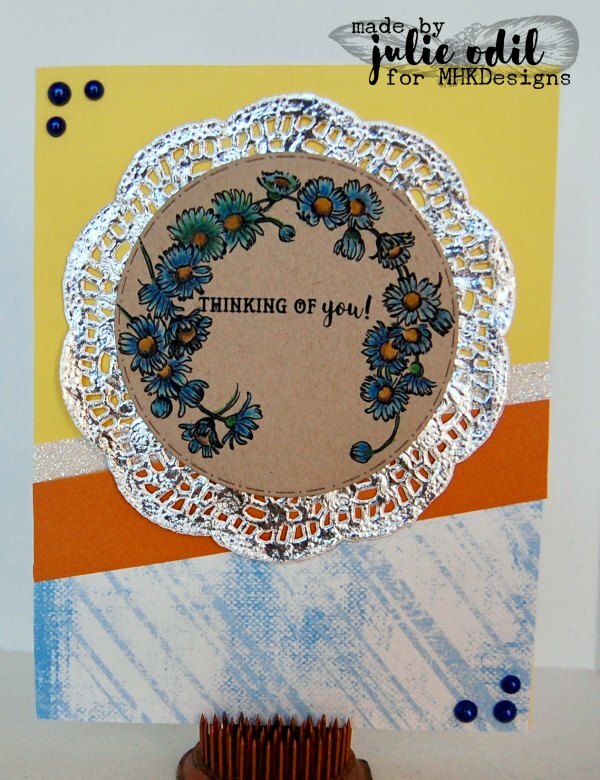 The card base is a die from Tattered Lace. I hope you can join us this month at The Path of Positivity Challenge Blog for our 'Shades of Blue' theme. You have until Feb. 4 to join in the fun! Hellloooooo! You there?!? 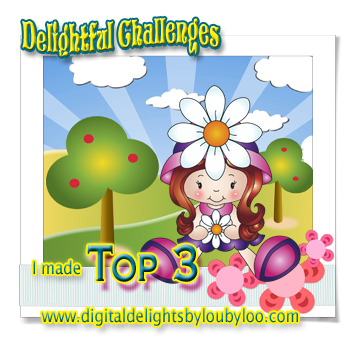 That's the message of this oh-so-fun digi I want to share with you today! This is my second post today. It's a super cold Saturday and I've been busy creating! 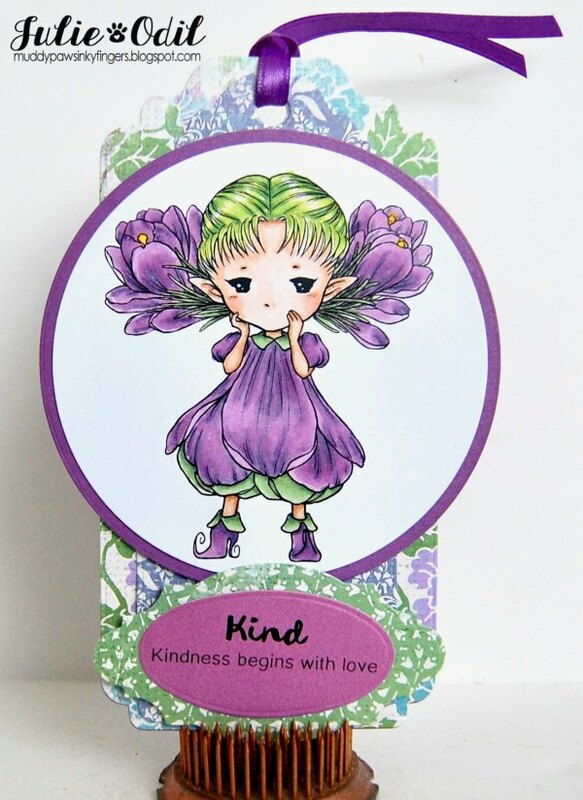 This card uses a digi from Bloobel Digital Stamps. She's a brand new release, and you can find her here. You can find all the awesome Bloobel stamps at Bloobel.com. 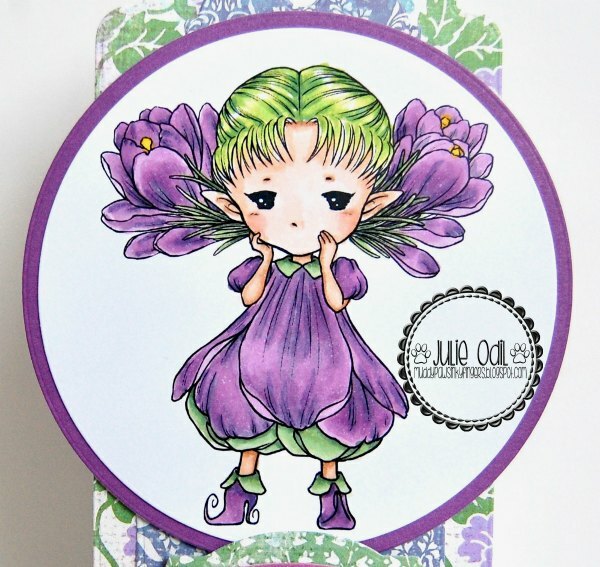 Lisa, of Bloobel Digital Stamps, has such a unique style. These stamps are soooooo fun to color! I used Copic markers on this one, titled 80's Telephone. I used some of my favorite Copic combinations on this cutie, so it was fun, fun, fun! The sentiment was computer generated, then cut out with a couple dies from Tattered Lace. The frame around 80's Telephone is by Craftin' Desert Divas. Papers on this card have been on my stash for a few years, and I no longer no the company. They were just scraps. The telephone embellishment was a file I found at Silhouette Online Store and cut out on my new Silhouette Cameo 3. Hello, my crafty friends! I have a darling image and wonderful sentiment to share with you today. 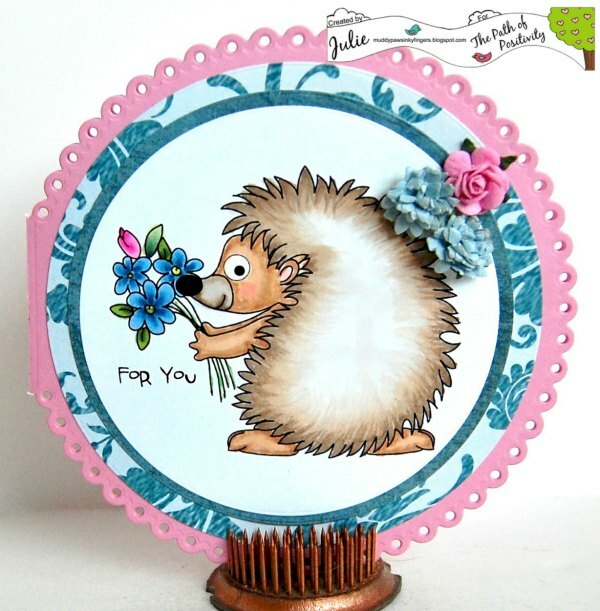 I created it for the "Anything But a Card" challenge going on right now at the Aurora Wings Challenge Blog. I love creating tags, so that's what I did! It was minus 22 Fahrenheit here this morning, so when looking through my Aurora Wings images to decide what to color, this lovely Crocus Sprite jumped out at me. Crocuses are the harbingers of spring, and spring sounds very, very nice right about now!!! Isn't she just the sweetest? This is one of the most common colors for crocus, and the color that can be found in my yard, so that's what I used to color her up. Here's a close up of the coloring. I used Copic markers on this Crocus Sprite. A couple years ago, my husband and I were on a fall mini vacation 5 hours North of us in Northern Minnesota. We stumbled across a Ben Franklin store. I thought they'd all gone out of business many years ago, but there it was, in the small town of Grand Marais. I found a bunch of ribbon there. The crocus colored ribbon on this tag was purchased there -- 10 yards for $1.59! What a bargain! I've been waiting for the right moment to use some of it, and this was it! 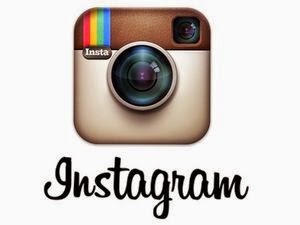 Papers for this tag are digital, and were purchased at Snap Click Supply. I love the art of Mitzi Sato-Wiuff. She is a talented artist with an eye for the whimsical. I realized when picking out this Crocus Sprite that I own 57 of her digi stamps! I better get coloring! You can find them either in her Etsy Shop or at AuroraWings.com. There's a great Facebook group, too, where you'll find inspiration, fun, news of sales, and even freebies! Now, I'm off to link up to the Anything But a Card Challenge! Come join the fun! It's Friday! It's the first Friday of 2018! It's the first challenge of 2018 at QKR Stampede Challenge Blog. Starting today, the challenges are always Anything Goes. Every week -- Anything Goes. How fun is that!!???!? 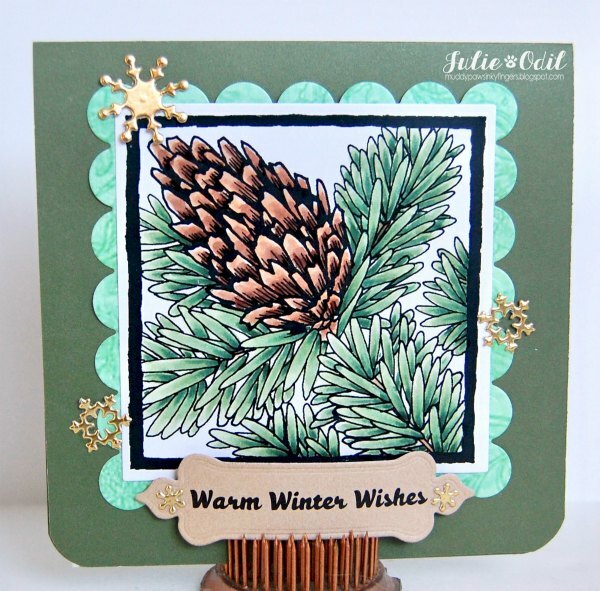 This card uses Winter Set of 4 digi stamps (ES-digi35001), colored with Copic markers. This is just one of the 4 beautiful images in this set of 4 from the Winter Set. The sentiment is computer generated. I hope you can join us this week at QKR Stampede for our Anything Goes Challenge. We've got great prizes (like this awesome digi!) and I'd love to see what you make! It's January 1st (Happy, scrappy New Year, crafty friends!) and it's time for a new challenge at the 12 Months of Christmas Link Up. This month's alternate theme is "frosty". 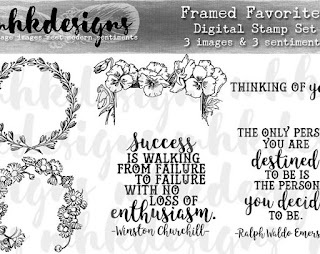 Our 2 sponsors this month are Scribbles Designs and Decosse's Dynamite Doodles. I computer generated the sentiment, colored the snowman with Copic markers, then fussy cut it out. The snowflakes are dies from Paper Wishes, cut out with gold foil paper from Spellbinders. Adorable snowman, isn't he? It's -18 degrees fahrenheit here in NW WI this afternoon, so he stands no chance of melting for a long time to come!!!! Please link up with us at the 12 Months of Christmas Link Up. 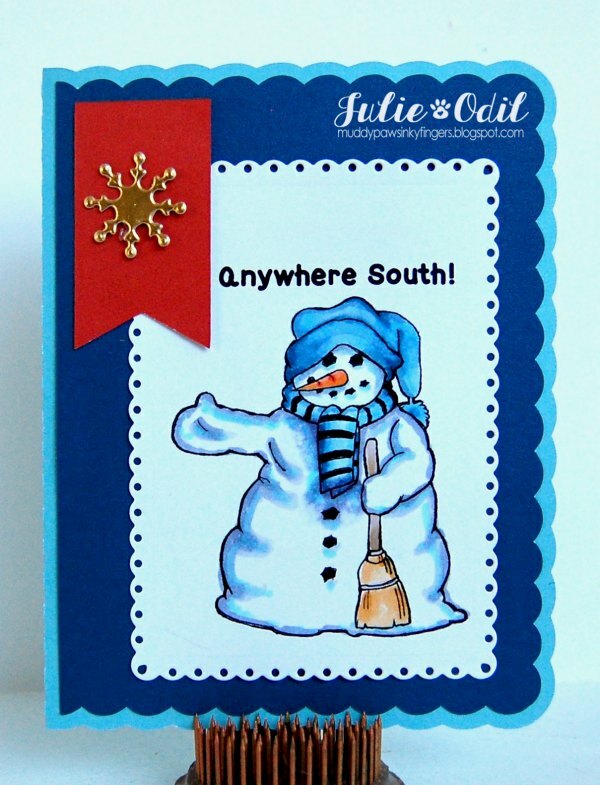 Follow the optional Frosty theme to be eligible for the prize from Scribbles Designs. 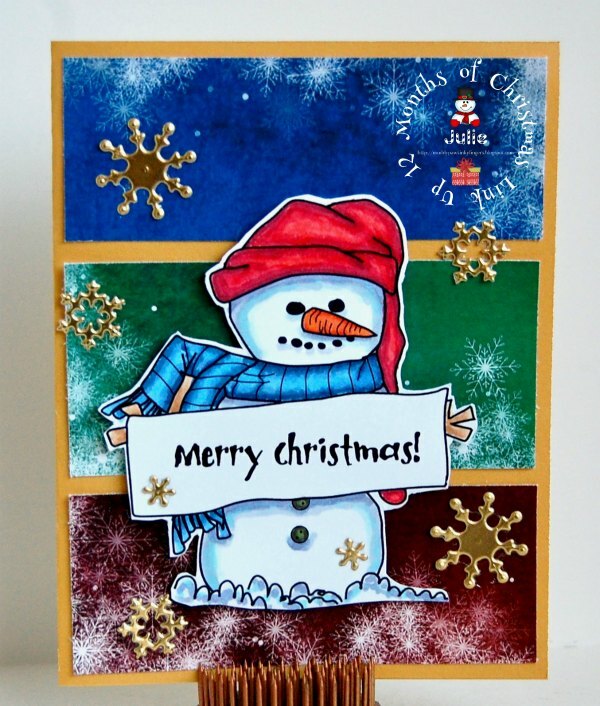 Enter 2 Christmas cards to be eligible for this month's paper from Decosse's Dynamite Doodles. Woop! And Happy New Year! Happy New Year, crafty friends! I'm hoping for a healthy, happy 2018! My goal is cancer free all the way through, for many years to come. Great quote, right? 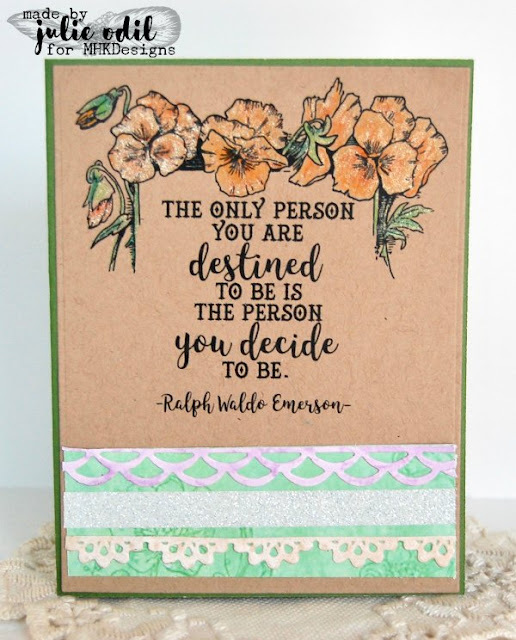 I printed the Framed Favorites pansies and quote on Kraft paper, then colored the pansies with Spectrum Noir Aqua Blend pencilsS, using a Close To My Heart clear shimmer brush to blend the colors. In real life, there's lots of sparkle and shine on the pansies. 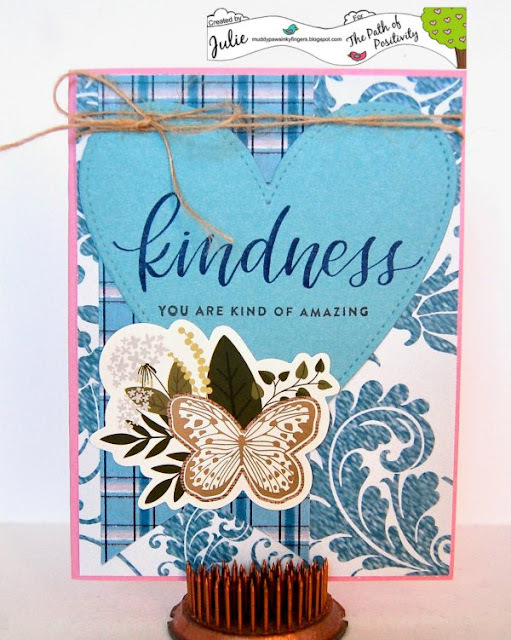 Papers used on the border of the card are also from MHKDesigns. 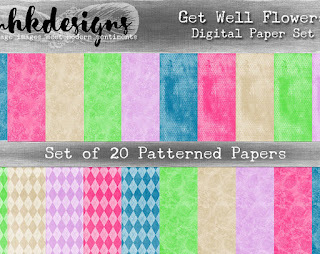 They are part of the Get Well Flowers digital paper pack (one of my personal favorites!). The borders are dies from Spellbinders, with a little glimmer trim from CTMH. 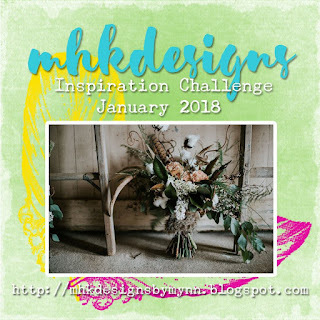 Come join the challenge at MHKDesigns! You have the whole month of January to join in the fun!